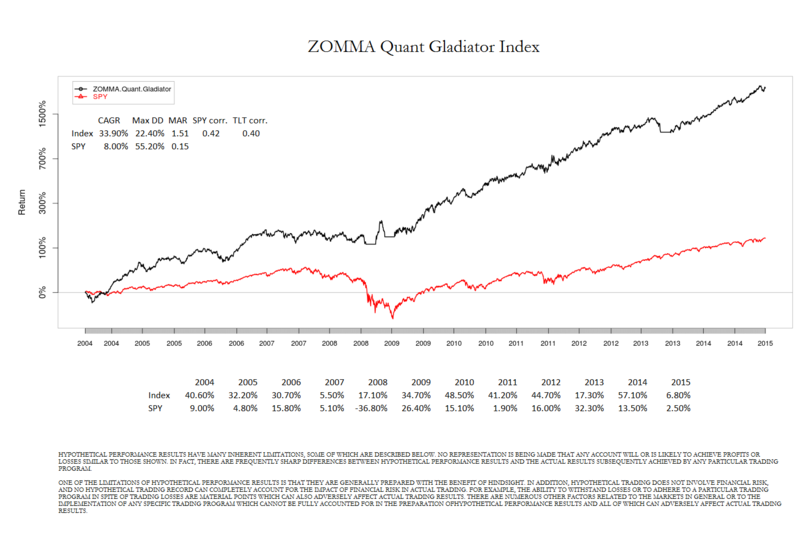 This post will be directed towards those newer in investing, with an explanation of drawdowns–in my opinion, a simple and highly important risk statistic. As it turns out, millions of people do, and did. That is the S&P 500, from 2000 through 2012, more colloquially referred to as “the stock market”. Plenty of people around the world invest in it, and for a risk to reward payoff that is very bad, in my opinion. This is an investment that, in ten years, lost half of its value–twice! At its simplest, an investment–placing your money in an asset like a stock, a savings account, and so on, instead of spending it, has two things you need to look at. First, what’s your reward? If you open up a bank CD, you might be fortunate to get 3%. If you invest it in the stock market, you might get 8% per year (on average) if you held it for 20 years. In other words, you stow away $100 on January 1st, and you might come back and find $108 in your account on December 31st. This is often called the compound annualized growth rate (CAGR)–meaning that if you have $100 one year, earn 8%, you have 108, and then earn 8% on that, and so on. The second thing to look at is the risk. What can you lose? The simplest answer to this is “the maximum drawdown”. If this sounds complicated, it simply means “the biggest loss”. So, if you had $100 one month, $120 next month, and $90 the month after that, your maximum drawdown (that is, your maximum loss) would be 1 – 90/120 = 25%. When you put the reward and risk together, you can create a ratio, to see how your rewards and risks line up. This is called a Calmar ratio, and you get it by dividing your CAGR by your maximum drawdown. The Calmar Ratio is a ratio that I interpret as “for every dollar you lose in your investment’s worst performance, how many dollars can you make back in a year?” For my own investments, I prefer this number to be at least 1, and know of a strategy for which that number is above 2 since 2011, or higher than 3 if simulated back to 2008. Most stocks don’t even have a Calmar ratio of 1, which means that on average, an investment makes more than it can possibly lose in a year. Even Amazon, the company whose stock made Jeff Bezos now the richest man in the world, only has a Calmar Ratio of less than 2/5, with a maximum loss of more than 90% in the dot-com crash. The S&P 500, again, “the stock market”, since 1993, has a Calmar Ratio of around 1/6. That is, the worst losses can take *years* to make back. A lot of wealth advisers like to say that they recommend a large holding of stocks for young people. In my opinion, whether you’re young or old, losing half of everything hurts, and there are much better ways to make money than to simply buy and hold a collection of stocks. An investment has a history–that is, in January, it made 3%, in February, it lost 2%, in March, it made 5%, and so on. By shuffling that history around, so that say, January loses 2%, February makes 5%, and March makes 3%, you can create an alternate history of the investment. It will start and end in the same place, but the journey will be different. For investments that have existed for a few years, it is possible to create many different histories, and compare the Calmar ratio of the original investment to its shuffled “alternate histories”. Ideally, you want the investment to be ranked among the highest possible ways to have made the money it did. To put it simply: would you rather fall one inch a thousand times, or fall a thousand inches once? Well, the first one is no different than jumping rope. The second one will kill you. Here is some code I wrote in R (if you don’t code in R, don’t worry) to see just how the S&P 500 (the stock market) did compared to how it could have done. That red line is the actual performance of the S&P 500 compared to what could have been. And of the 1000 different simulations, only 91 did worse than what happened in reality. This means that the stock market isn’t a particularly good investment, and that you can do much better using tactical asset allocation strategies. In this case, the compound annualized growth rate is nearly double that of the maximum loss. For those interested in something a bit more aggressive, this strategy ensemble uses some fairly conservative strategies in its approach. In conclusion, when considering how to invest your money, keep in mind both the reward, and the risk. One very simple and important way to understand risk is how much an investment can possibly lose, from its highest, to its lowest value following that peak. When you combine the reward and the risk, you can get a ratio that tells you about how much you can stand to make for every dollar lost in an investment’s worst performance. NOTE: I am interested in networking opportunities, projects, and full-time positions related to my skill set. If you are looking to collaborate, please contact me on my LinkedIn here. This post will introduce my up and coming IKReporting package, and functions that compute and plot rolling returns, which are useful to compare recent performance, since simply looking at two complete equity curves may induce sample bias (EG SPY in 2008), which may not reflect the state of the markets going forward. In any case, the motivation for this package was brought about by one of my readers, who has reminded me in the past of the demand for the in-the-ditches work of pretty performance reports. This package aims to make creating such thing as painless as possible, and I will be updating it rapidly in the near future. The strategy in use for this post will be Flexible Asset Allocation from my IKTrading package, in order to celebrate the R/Finance lightning talk I’m approved for on FAA, and it’ll be compared to SPY. This is a simple function for computing running cumulative returns of a fixed window. It’s a quick three-liner function that can compute the cumulative returns over any fixed period near-instantaneously. So how does this get interesting? Well, with some plotting, of course. Here’s a function to create a plot of these rolling returns. While the computation is done in the first line, the rest of the code is simply to make a prettier plot. 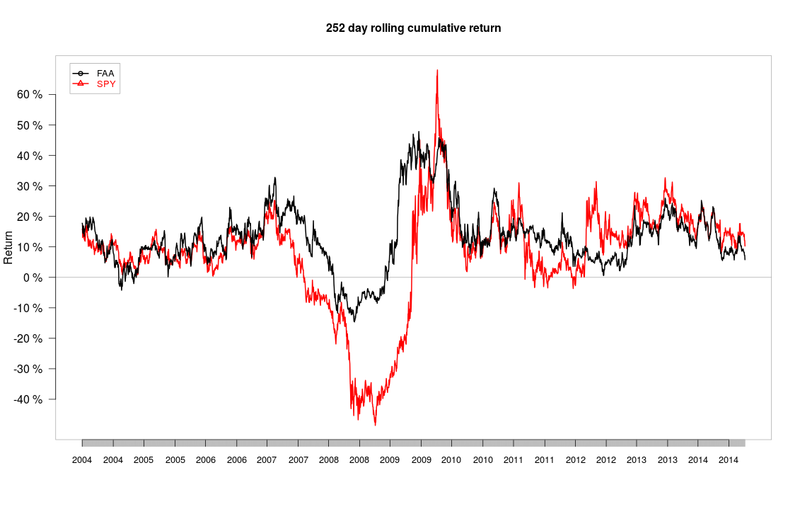 Here’s what the 252-day rolling return comparison looks like. So here’s the interpretation: assuming that there isn’t too much return degradation in the implementation of the FAA strategy, it essentially delivers most of the upside of SPY while doing a much better job protecting the investor when things hit the fan. Recently, however, seeing as to how the stock market has been on a roar, there’s a slight bit of underperformance over the past several years. 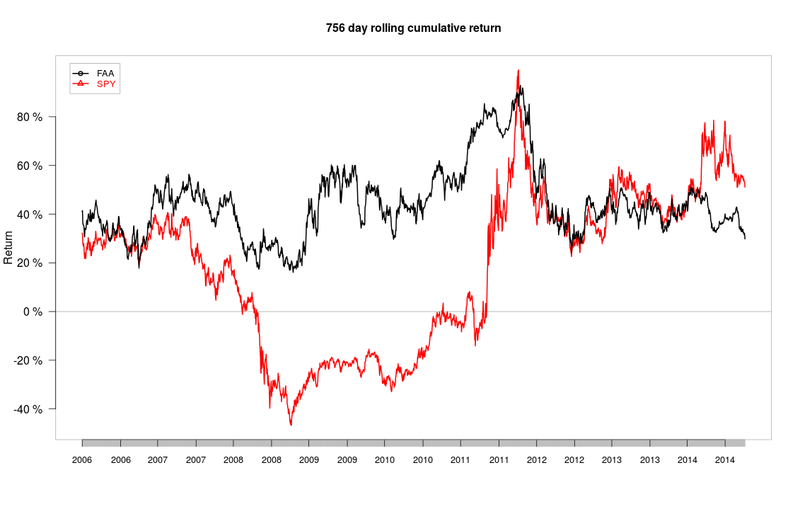 However, let’s look at a longer time horizon — the cumulative return over 756 days. This offers a much clearer picture–essentially, what this states is that over any 756-day period, the strategy has not lost money, ever, unlike SPY, which would have wiped out three years of gains (and then some) at the height of the crisis. More recently, as the stock market is in yet another run-up, there has been some short-term (well, if 756 days can be called short-term) underperformance, namely due to SPY having some historical upward mobility. This is a strategy I have collaborated with Harry Long from Seeking Alpha on. While I’m under NDA and am not allowed to discuss the exact rules of this particular strategy, I can act as a liaison for those that wish to become a client of ZOMMA, LLC. While the price point is out of the reach of ordinary retail investors (the price point is into the six figures), institutions that are considering licensing one of these indices can begin by sending me an email at ilya.kipnis@gmail.com. I can also set up a phone call.